The Register of the United Grand Lodge of England contains two Lodge entries bearing the title 'Royds'. These refer to The Royds Lodge No. 816, which meets in the Province of East Lancashire, and The Royds Lodge No. 1204, which meets in the Province of Worcestershire. In addition to The Royds Lodge No. 1204, the Worcestershire Masonic Year Book contains several references to Albert Hudson Royds, the Deputy Provincial Grand Master of that Province from 1857 to 1865 and the Provincial Grand Master from 1866 to 1878. The lineage of the Royds family was first published in 'The Pedigree of The Family of Royds', in 1910, by the Hon. Col Sir Clement Molyneux Royds CB, TD, MP. This document was updated in 1952 by the late Lt Col the Rev. Giles Royds Brocklebank, who was a Past Grand Chaplain of the United Grand Lodge of England. 'The Pedigree of The Family of Royds', together with other archives, document the growth of the family between the 14th and 16th centuries and clearly show the development of the family name in its transition from 'del Rode' to 'Royds'. The earliest traces of the Royds family are to be found at Soyland, then a small town approximately 5 miles south-west of Halifax, in the West Riding of Yorkshire. The earliest family record refers to John del Rode, who died in 1334, and reads, "John del Rode (dead in 1393) had messuage and 24 acres 'le Brigge' in Soyland, Graveship of Sowerby, Halifax, and a messuage of 7.5 acres." The Royds family remained in the Halifax area until approximately 1500, when they relocated to Rochdale, approximately 20 miles form their original home town and in the neighbouring county of Lancashire. Following their move to Rochdale, records show that the Royds family held property in Wolstenholme and later in Little Wardle. They became firmly established when the right to bear arms was confirmed by Robert Cooke, Clarenceux, to William Rodes of Skyrket, County of York, in 1585. During the 17th and 18th centuries, the family, appreciating the growth in trade throughout the country, developed, together with their continuing interest in yeoman farming, a strong connection as wool-staplers. An inventory of the goods and chattels of John Royds of Castleton, dated the 27th November 1731, showed he possessed a well stocked farm and comfortably furnished house. The inventory reveals a stock of 11 cows, 2 horses, 2 pairs of looms and an extensive stock in the shop, all valued at a total of £718.18.11d. Two generations later in 1786, James Royds of Falinge purchased land at Brownhill and later, in the same vicinity, built Mount Falinge. Mount Falinge was built in a commanding position on sloping land between Cronkeyshaw and Falinge Road. The 18-acre park stretched from the junction of Sheriff Street and Falinge Road to Cronkeyshaw. In 1826, James Royds produced a hand-written account of the family. This account was found at Mount Falinge shortly after his death on the 2nd February 1842. The account revealed that James Royds married Mary of Rochdale (1767-1816), the fourth and youngest daughter of Charles Smith and Theodosia Ann Eyre of Lisbon, in 1784. They had 12 children, of which Clement was the eldest. The account also documents Albert Hudson Royds' lineage, describing how he married Jane, the daughter of Charles Hudson of Halifax, in 1810. On the 11th September 1811, their first child, Albert Hudson Royds, was born at Mount Falinge. He was followed by Emma, Edmond, William Edward, John and Julia. In 1827, Albert Hudson Royds' father, Clement, entered the world of banking by purchasing the Rochdale business of Messers Rawson & Co. and began the process of ending his wool-stapling affairs. Clement lived until 1854, having been the Chief Magistrate for many years and, in 1850, the High Sheriff of Lancaster. The bank, better known as the Rochdale Bank, and at one stage as Messers Clement Royds and Company, was later merged into the Manchester and Salford Bank. The bank was then absorbed by its London agents, William Deacons Bank, and is now part of the Bank of Messers Williams and Glyn. Albert Hudson Royds, whose birth had taken place on the 11th September 1811, was baptised at St Mary's Church in Rochdale. He was educated at Mr Littlewood's Academy in Rochdale and later at Mr Pickford's school in Hammersmith. Among his contemporaries at Mr Littlewood's was John Bright, the great Liberal reformer who, from 1857 to 1887, was a Member of Parliament for Birmingham. In one of his earliest notes written at the age of 13, Albert Hudson Royds recalled his first journey home to Rochdale from his school in Hammersmith. The journey, necessary so he could celebrate Christmas with his family, took 30 hours on the stage-coach between London and Manchester. He reached the Royal Hotel at 9 o'clock in the evening and 'found, to his great joy, his dear, good mother on the look out for him'. Albert Hudson Royds took his seat in the family bank in 1827 when he was 16. His brother, William Edward, who was six years younger, joined him some time later. Both men soon became active partners in the firm and, by the 1840's, had became responsible for its general management, replacing their father, Clement, who by this time had become almost wholly involved with public life and his political career. On the 24th September 1835, there took place an incident that that was to have some effect on the health of Albert Hudson Royds in his later life. Accompanied by his younger brother, William Edward, and a groom, Albert Hudson Royds returned home on horse-back at ten o'clock in the evening after dining with a friend at Prestwick. On reaching Slattacks, they were attacked by a gang of robbers. During the attack, William was thrown from his horse and violently assaulted. On seeing this, Albert spurred his horse, charged, and released his brother from the assailants before throwing them some money in an attempt to put an end to the incident. They, not being content with this, renewed their attack and attempted to pull Albert Hudson Royds from his saddle. After the attack, both Albert and William had broken shoulder-blades. When the robbers had fled, Albert carried his brother to the shelter of the nearby Turnpike House before riding on to raise the alarm. With assistance, the robbers, Eastwood, Elson and Kay, were found and apprehended. They were, in due course, tried at Liverpool Assizes, convicted and sentenced to deportation for life. On appeal, the sentence of Eastwood was quashed by the Home Secretary. During the attack, Albert Hudson Royds attempted to preserve his gold watch by slipping it into the leg of his breeches. However, on noticing the bulge, the robbers became suspicious, removed the boot and smock, and fled. The stolen watch was afterwards found in a ploughed field near to the scene of the robbery and was subsequently presented to Messers Williams and Glyn's Bank by Mr James Henry Royds. Despite his bravery, it cannot be denied that Albert Hudson Royds was greatly assisted by his horse, which was said to have kicked and bitten the robbers. A portrait of the horse, which had become a family heirloom, was painted and, after its death many years later, its hooves were preserved as door-stops. Albert Hudson Royds claimed that the injuries received that day accounted for the back trouble from which, later in life, he suffered and which, at one stage, deprived him of the use of his legs. The thorn stick, used as the weapon of assault by the robbers and later wrestled from them and used in retaliation, was entrusted to the safe-keeping of The Royds Lodge No. 1204 and can still be seen in the Lodge room in Malvern today. In 1844, Albert Hudson Royds raised the Rochdale Troop of the Duke of Lancaster's Own Yeomanry. He went on to command the unit for seven years. In his obituary notices, references were made to his founding of the Lyceum, an educational establishment in Baillie Street, Rochdale. In 1856, at the time of the incorporation of Rochdale, Albert Hudson Royds was elected as a representative of the Spotland Ward, made an Alderman and became a strong candidate for the office of the first Mayor. However, the Liberal party claim was stronger and the honour fell to Mr Jacob Bright. Albert Hudson Royds' move to Worcester in 1856 coincided with the third of these events. While in Worcester, he continued his magisterial duties and became the High Sheriff of Worcestershire in 1865. Albert Hudson Royds married Susan Eliza on the 5th March 1839 at Kempsey, near Worcester. Susan Eliza, who was only 17 at the time of the wedding, was the only child and heiress of Robert and Susan Nuttall of Kempsey House. The marriage proved to be unsuccessful and the relationship ended in 1846 when Susan Eliza left the family home. She returned for a short time in 1855, but this proved to be temporary. She died in Brighton in 1869. Edmund Albert Nuttall Royds (1845-1892). Albert Hudson Royds' sons were educated at Eton. The elder, at the age of 21, incurred his father's displeasure, left England and sailed for Canada. He returned in 1867 to marry Mary Alice Gibson Beswicke (1840-1917), the only child of John Halliwell Beswicke. Their marriage took place on the 9th May 1867, after which Clement Robert Nuttall Royds proceeded to anger his farther yet further by adopting the surname Beswicke-Royds. Shortly after the marriage, Mary Alice Gibson Beswicke-Royds gave birth to their only child, a son named Clement Halliwell Beswicke-Royds (1868-1940). According to Mr James Henry Royds, the current head of the family, the animosity between father and son caused Albert Hudson Royds to pass the entire residue of his estate to Edmund Albert Nuttall Royds on his death. Clement Robert Nuttall Beswicke-Royds, who had been initiated into Benevolence Lodge No. 273 (later No. 226) in 1859, contributed to Masonry a career of over 50 years and from 1896 to 1908 was the Deputy Provincial Grand Master of East Lancashire. Albert Hudson Royds' youngest son, Edmund Albert Nuttall Royds, was a firm favourite of his father. He was born in 1845 and died, at the early age of 47, at Ellerslie, in 1892. He was called to the Bar but never practised, and was very active in the Worcestershire Yeomanry and the King's Own Royal Lancashire Volunteer Regiment. Edmund Albert Nuttall Royds is of particular significance as he was a founder member and the first Junior Warden of The Royds Lodge No. 1204, and an active member of the Worcester Lodge No. 280. At the time of the consecration of The Royds Lodge No. 1204, he was a Past Master of The Royds Lodge No. 816, which meets today at Todmorden in the Province of East Lancashire. He became the Deputy Provincial Grand Master for Worcestershire for one year in 1872 and remained a member of The Royds Lodge No. 1204, attending occasionally, until his resignation in 1884. Susan Jane was very dear to her father and was known to him as 'my little lassie'. She supported him loyally, wrote his letters during his periods of illness and, with Miss Brook, who was affectionately known as 'Boo', managed his domestic affairs. In 1872, she married Col Henry Scobell at Great Malvern Priory. It was, according to the Malvern Advertiser, a fashionable wedding and a day of great rejoicing. However, their happiness was to be short-lived as Col Henry Scobell tragically died in April of the following year. Susan Jane's health, which had not been good, rapidly declined and she died on the 13th January, 1878. At the time of his first marriage, Albert Hudson Royds lived at Brownhill, Rochdale. On his father's death in 1854, he moved, for a short time, across the Park to Mount Falinge. His brother, William, succeeded his father as the senior partner in the bank. Following his father's death, Albert Hudson Royds opted for a complete change of life and in 1855 he purchased the estate of 382 acres, mainly in Rushwick, near Worcester, called Crow Nest or Crown East. He rebuilt the house, renamed it Crown East Court, erected new outbuildings and stables, cottages and a church, and entered Worcestershire society as a landed proprietor and a model farmer. The architect of the new Crown East Court was believed to have been Mr William J. Hopkins, the Worcester Diocesan Architect. After a relatively short time, Albert Hudson Royds sold Crown East Court to Henry Bramwell of Wiganthorpe, Yorkshire, bought Ellerslie in Great Malvern and moved there in 1869. The church at Crown East was re-erected on its present site by the Bramwell family in 1876 and later donated to the Diocese. Albert Hudson Royds married again 1878. His second wife, Cristina Brook, had been his daughter's companion and governess since 1855. He remained at Ellerslie until the 22nd May 1878, when he moved back to Rochdale, first to Falinge Lawn and later to Brownhill. There can be little doubt that Albert Hudson Royds derived great joy from his return to the area steeped in family history. Mount Falinge, built by his ancestor James Royds, was situated on an elevated site near Brownhill. From the window of Mount Falinge it would have been possible to look out on St Clement's Church, Spotland, dedicated to that saint out of compliment to his father. From this vantage point it would also have been possible to see Christ Church, Healey, where so many members of the family lie buried. Falinge Park was eventually gifted to the town by Alderman Samuel Turner, the grandson of Albert Hudson Royds and the Mayor of Rochdale from 1901 to 1903, in commemoration of the Coronation of King Edward VII on 5th August 1905. Prior to his donation, Alderman Turner spent £3,500 on walkways, flower-beds and landscaping. He erected a bandstand in 1907 (which was restored in 1999) and extended the park in 1911 on the Coronation of King George V.
Mount Falinge, of which only the windowless facade exists today, is now heavily fenced off and neglected. In December 1875, Albert Hudson Royds was attacked by a severe bodily infection and lost the use of his legs. He walked again in 1879 and on Dr Sandwell's advice moved to the White House Cottage, Lytham, in 1881. He returned to Rochdale six years later in but his health and his eyesight began to fail and he died on the 17th January 1890 and was buried in the presence of his relatives at Christ Church, Healey. His grand-daughter, Mrs Susan Goldsmith, who was born at Ellerslie in 1882, remembered him as a man of very strong will and temper. She went riding with him in Rochdale in his donkey carriage and recalled that, at Ellerslie, he built an archery court for his daughter and constructed a drinking trough on the Wells Road in Great Malvern. His diaries and letters bear witness to his determined character and also to his deeply rooted Christian faith. St Edmund's Church was built by Albert Hudson Royds in 1874 in memory of his parents. Details of the church are described more fully in a separate and most interesting paper delivered in 1933 by W.Bro. Baxter to the Manchester Association for Masonic Research. Albert Hudson Royds spent between £20,000 and £30,000 on the building and was clearly determined that it should bear evidence of his Masonic convictions in all its features. This was a considerable sum, as the average cost to build a church at that time was approximately £5,000. Raised on a roughly hewn plinth, the overall dimensions are proportional to those of King Solomon's Temple; its length being three times and its height one and a half times its breadth. The heavily timbered roof is supported by external buttresses and access to the tower is by means of a winding staircase. The East Window situated in the Royds Chapel is a marvellous example of Masonic symbolism in its architectural design, and is appropriately filled with pictorial representations of the designing, building and decoration of the Temple at Jerusalem. In the centre light the three Grand Masters are shown with the plan of the Temple, or at all events what purports to be the plan, and the figure of Hiram Abif, wearing a Master Mason's cap, preserves the lineaments of Albert Hudson Royds. The right hand light shows the workmen busy with the masonry, while the left hand light shows the priests and populous celebrating the completion of the building. In the central pentagon of each pentalpha are, from left to right, the emblems of the Craft, the Ancient and Accepted Rite and the United Religious, Military and Masonic Orders. 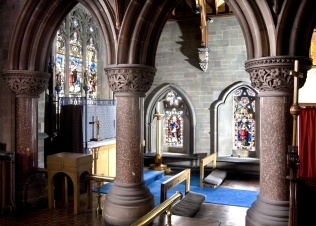 The font and lectern donated by Albert Hudsons Royds' sons, Clement and Edmund, are adorned with Masonic symbols. It is sad to relate that a part of this beautiful edifice was ravaged by dry-rot and that its diminishing congregation faced the almost impossible task of finding £30,000 for repairs. In 2006, the Rev. David Finney, vicar at both St Edmund's and St Mary's, was informed by the diocese that the church would close. Rev. Finney noted that the church was situated in an area with a high Muslim population and that its potential had finally come to an end. Today, the future of the church remains uncertain, but being a Grade Two listed building, it cannot be demolished. Mr Andy Marshall, an architectural photographer who recorded the interior of St Edmund's Church in 2008, has published a set images in his St Edmund's Church Image Collection. Albert Hudson Royds' Masonic career began on the 8th December 1847 when he was 36 years of age. On that day he was initiated into the Lodge of Benevolence No. 273 (later No. 226) at the Red Lion Hotel, Littleborough, in the Province of East Lancashire. His promotion came rapidly when, in 1849, he was installed as Worshipful Master and he remained in the chair for the following year. He played little part in the work of the Lodge afterwards, but he was elected Worshipful Master for a third time in 1884. He was forced to decline the honour for health reasons. He held office in the Provincial Grand Lodge of East Lancashire from 1850 to 1856 as Provincial Grand Junior Warden and from 1856 to 1866 as the Deputy Provincial Grand Master. In 1855, on his move to Worcestershire, the became equally involved in the Masonry of that Province. For convenience, however, the remaining details of his Masonic work in East Lancashire will be given first. In 1860, Albert Hudson Royds was one of the petitioners for the foundation of The Royds Lodge No. 816. Its consecration took place on the 3rd October 1864 at the Spring Gardens Inn, Wardle. The ceremony was performed by R.W.Bro. Stephen Blair, assisted by his Deputy, Albert Hudson Royds. There is speculation as to the founding of the Lodge at Wardle. The petition for the formation of this Lodge reads, 'For the conveniency of our respective dwellings and other good reasons.' It is possible that Albert Hudson Royds may have had some influence in attracting the foundation to a village with which he had ancestral connections. The Lodge moved its meeting place later to the Sun Inn, Featherstall, thence to the Falcon Inn, Littleborough and at the time of its Centenary in 1960 was meeting at the Red Lion, Littleborough. Today, The Royds Lodge No. 816 remains active and healthy, meeting at the Masonic Hall, Todmorden. On the 14th October 1864, Albert Hudson Royds joined the Lodge of Fortitude No. 64, a Manchester Lodge of which he became the Worshipful Master in 1868. After taking up residence in Worcestershire, he was elected a joining member of the Worcester Lodge No. 349 (later No. 280) on the 6th January 1856. Already the Deputy Provincial Grand Master of East Lancashire, in 1857 he was appointed to the same office in Worcestershire. He played little part in the work of the Worcester Lodge but, until his appointment in 1866 as Provincial Grand Master, attended its meetings, at least annually. The investiture of Albert Hudson Royds as Deputy Provincial Grand Master for Worcestershire took place, it can be assumed, at the Annual Meeting of Provincial Grand Lodge, held in the Corn Exchange, Stourbridge, on the 8th September 1857. He presided at an Emergency Meeting at the Bell Hotel, Worcester, on the 30th April 1858 and, from that year until 1864, assisted the R.W.Bro. H. C. Vernon, Provincial Grand Master, at the Annual Meetings of Provincial Grand Lodge. There was no meeting of Provincial Grand Lodge in 1865 but ill health having compelled R.W.Bro. H. C. Vernon to resign, Albert Hudson Royds, as Provincial Grand Master Designate, preformed the ceremony of the consecration of the Lodge of St Michael No. 1097 at Tenbury. At this consecration Sir Frederick Ouseley, its founder, was installed as the Worshipful Master. His installation as the Provincial Grand Master for Worcestershire took place at the Guildhall, Worcester, on the 21st June 1866. At an Emergency Meeting of the Worcester Lodge No 280, the officers of Provincial Grand Lodge entered and R.W.Bro. H. C. Vernon names his successor, Albert Hudson Royds. The installation was performed by R.W.Bro. Stephen Blair, the Provincial Grand Master of East Lancashire and an old friend of the new Provincial Grand Master. From the Guildhall, approximately 150 brethren marched in procession to Worcester Cathedral. Worcester Cathedral had been a place of prayer and worship since 680, but the construction of the present building began in 1084. In 1866, the cathedral was undergoing extensive repairs and Provincial Grand Lodge agreed to donate the sum of £50 towards the fitting of a Masonic window. At the cathedral, a sermon was delivered by Bro. Sir Frederick Ouseley and a further collection of £26.5.6 was made towards the cost of the proposed new window. Refreshments were afterwards served at the Shirehall where Sir Frederick Ouseley played the piano. The newly installed Provincial Grand Master, in responding to his toast, informed the brethren that only ten years ago he came among them, comparatively unknown. He thanked them for receiving him with such warmth and announced that he had also been selected for the office of High Sheriff of Worcestershire. On the 18th June 1867, Provincial Grand Lodge was held at the Corn Exchange, Kidderminster. The Provincial Grand Master took the chair and the meeting was followed by a procession to St Mary's Church, where the sermon was again delivered by Sir Frederick Ouseley before the brethren returned to the Corn Exchange for a banquet. On December 30th of the same year, Provincial Grand Lodge met at Townsend House, Great Malvern, for the consecration of The Royds Lodge No. 1204. The Provincial Grand Master was prevented from attending by the death of a relative. Instead, the ceremony was performed by the Deputy Provincial Grand Master, W.Bro. John Barber. During the ceremony, W.Bro. Albert Brown, a Past Master of Lodge Semper Fidelis No. 529 was installed as Worshipful Master. At the consecration. W.Bro. W. C. Ward-Jackson was appointed the Senior Warden, with Albert Hudson Royds' son, Edmund Albert Nuttall Royds, being appointed as Junior Warden. On the 10th August 1869, a special meeting of Provincial Grand Lodge was held in the Chapter House of Worcester Cathedral. Before the meeting, the brethren marched in procession to the Cathedral where the Provincial Grand Master unveiled the new Masonic window which had been built in the north transept and not the nave as was originally intended. R.W.Bro. Albert Hudson Royds, the Provincial Grand Master, said, "Very Reverend Mr Dean and Reverend Cannons. I ask you to accept this gift from the brethren of our ancient Craft and sometimes, when you look upon its mellowed light, may you be induced to say, 'O, wonderful Masons!'" The cost of the windows, nowadays more often referred to as The Twelve Apostles Window, was £530 and the work of designing, producing and installing was carried out by Messers Lavers, Barrand and Westlake of Bloomsbury. The restoration of the Cathedral, under the direction of Sir Giles Gilbert Scott, was completed in 1874, when the Masons were invited by the Dean and Chapter to occupy the seats below the window they had installed five years earlier. In 1870, Provincial Grand Lodge was held in Dudley and in 1871 and 1872 at Great Malvern. On the 7th May 1872, Albert Hudson Royds acted as the Deputy Grand Master of England while attending a special meeting of Grand Lodge, held in Birmingham. The meeting proceeded by special train to Knowle where the foundation stone of the Middle Class Idiot Asylum was laid by Lord Leigh, the Provincial Grand Master of Warwickshire. In 1873, Provincial Grand Lodge was held at Kidderminster and in 1874 in Stourbridge. On the 24th May 1875, Provincial Grand Lodge held a special meeting at which Albert Hudson Royds presided to lay the foundation stone of St Luke's Church, Dudley. Provincial Grand Lodge was held on the 22nd June 1875 at Worcester. This proved to be the last Provincial Grand Lodge attended by Albert Hudson Royds as it was in December of that year that he was attacked by a severe bodily infection and he lost the use of his legs. His absences at Dudley in 1876 and at Tenbury in 1877 evoked messages of sympathy. This handicap, coupled with the severe blow inflicted by the loss of his daughter, compelled him to resign from office on the 7th March 1878. The wider Masonic career of Albert Hudson Royds, including his membership of additional orders, are detailed below. Albert Hudson Royds was exalted into the Chapter of Benevolence No. 273 (later No. 226), in the Province of East Lancashire, on the 12th March 1848. He was installed as Most Excellent Zerubbabel of this Chapter in 1853. On moving to Worcestershire, Albert Hudson Royds joined St Wulstans Chapter No. 349 (now No. 280) on the 26th May 1858. He received Provincial honours some years later, serving as Grand Superintendent from 1866 to 1880. Albert Hudson Royds was advanced in the Abbey Lodge of Mark Master Masons No. 59, in the Province of Worcestershire, on the 28th November 1865. (This Lodge later became the Lechmere Lodge of Mark Master Masons No 59.) He did not progress to the chair of this Lodge and resigned on the 12th February 1878. Albert Hudson Royds was an active member of the United Religious, Military and Masonic Orders. He first joined the Edward Preceptory and was installed as its Eminent Preceptor in 1845. He went on to became the First Great Aide-de-Camp of the Great Priory in 1849. On the 30th January 1855, Albert Hudson Royds became a founder member and the first Commander of the Albert Preceptory No. 34. Some years later, on the 27th November 1861, while living in Worcestershire, he became a founder member of the Preceptory of St Amand No. 68. Albert Hudson Royds served as the Deputy Provincial Grand Commander of the Provincial Priory of Worcestershire from 1855 to 1861 and as the Provincial Commander from 1861 to 1877. During this period he was also the Provincial Grand Commander of the Provincial Priory of Lancashire. It should be noted that, from 1878 to 1899, Albert Hudson Royds was succeeded by his first son, Clement Robert Nuttall Beswicke-Royds, as Provincial Prior of Lancashire. The Royds Preceptory No. 149, which was consecrated on the 19th October 1880, was so named to perpetuate the esteem in which both Albert Hudson Royds and his son were held. On the 10th January 1860, Albert Hudson Royds became a founder member of the St Dunstan Chapter No. 12. This Chapter is in the District of Worcestershire. On the 8th April 1862 he was elected a member of The Supreme Council 33° and appointed Grand Captain General from 1869 to 1872. Albert Hudson Royds was undoubtedly as strong in physique he was in determination. He was a loving family man capable of deep human feelings and was held in high esteem by Masons and non-Masons alike. His acts of philanthropy and his devotion to Masonry contributed to his legacy, with two Masonic Lodges proudly carrying his Royds family name today. The Royds Lodge No. 1204 is particular proud to be associated with Albert Hudson Royds and his family, and displays several artifacts of his life in their Lodge room in Great Malvern. There were signs of impetuosity and his major financial investments were not always wise, but he would have been as terribly disappointed to learn of the fate of St Edmund's Church as he was to retire in from his model farm in 1869. His active role in the development of Masonry of East Lancashire and Worcestershire cannot be questioned and, as was typical of a man with such intelligence, status and drive, he attained high rank and fame within the fraternity.